The Peel-n-Stick Quick Cleat uses a No-Knot QUICK CLEAT mounted on a flexible vinyl laminate for easy positioning on your inflatable kayak, paddle board or inflatable boat. Rather than mounting another D-ring on your SUP or boat, choose the Quick Cleat. It's great for easily adjusting an anchor line, towing a friend, or tying-off a cooler or bait bucket. Position the 4 1/8 inch diameter Quick Cleat on a smooth surface using the super strong peel-and-stick VHB adhesive. 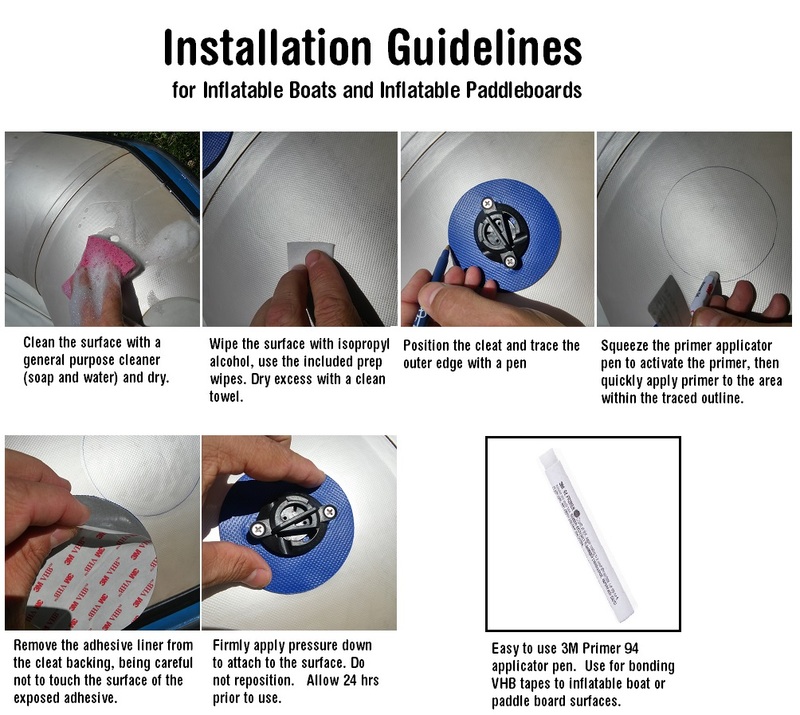 For PVC inflatable boats and inflatable paddle boards,use the adhesive primer pen (3M Primer 94) to ensure a secure bond. No drilling required! Easy mounting instructions with a surface prep wipe and a primer pen is included. To use, rotate the QUICK CLEAT, insert the rope, and done! No Knots needed! To adjust, simply pull the rope toward you, the rope will stay engaged in the cleat as you pull. To release the rope, simply rotate the cam to remove the rope. Use with 1/4" rope.